Autobiography is tricky. Done well, an author takes readers through a life’s journey to illuminate common ground or a larger point. Done poorly, the author comes off as stiff, or worse, self-indulgent. 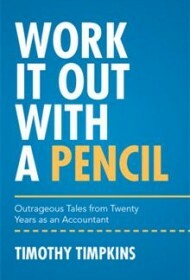 British author Timothy Timpkins’ memoir, Work It Out With A Pencil, shows glimpses of the first but often suffers from the latter. The billing as “outrageous tales from 20 years as an accountant” is misleading, as it only skims Timpkins’ career as a management and project accountant for unnamed firms ranging from the airline to construction industries. Instead, the book focuses more on his nights out with colleagues and business travels. Timpkins is a writer who understands pace and detail but doesn’t seem to recognize the difference between what works as a tale told at a pub versus something written. One hopes he continues digging deeper to hone his craft, as he clearly shows a gift for connecting with readers in his more intimate chapters.